I've sort of built up a few blog posts worth of stuff, so I'm going to do one after the other. Hope this isnt too tedious for you! 3 different fabric selections, and a pile of removed selvedges... there's been a whole lotta cutting done here! my scrap boxes, now with some decent scraps in 'em! Mum trimmed a nice 5" strip off most of my stash. She cut me two charms from every print, and the remainder went into my scrap boxes. Et voila! A much more respectable, interesting, and usable scrap stash! Wouldnt you say? Also, I got my January bee blocks done - so lovely to have sent them on time for a change... It was the wonderful Judith's month as queen bee, and she requested 2 denim framed log cabins of some kind. We were to pick a fabric of our own for the centre that would represent us. Oz block on left, second block on right. 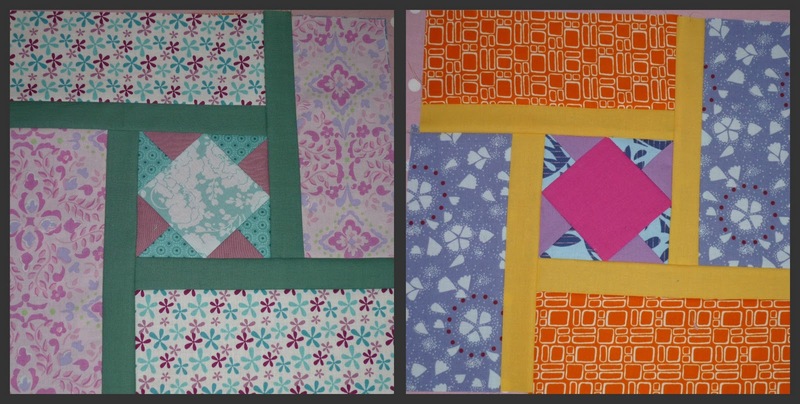 For the second block the centre piece is fabric I bought and hand dyed for my own bee quilt, and I did a hexagonal log cabin around it. I was quite pleased with this one, very neat for my standards! Mum wasnt sitting idle either, she made 2 blocks for Judith's charity bee, Bee Blessed. The requirements were for sampler style blocks from any book of your choice. Mum spotted my 99 Modern Blocks book and was raring to go! We had a very amusing Foundation piecing day.... After sitting there tutting at me and giving me lots of "sarah..."s with the disappointed tone mum very soon did me proud and almost out swore me by the end of it... talk about turning the air blue, it was everything from aqua to indigo.... Ah happy happy happy days! I have been challenged to make that complicated lookin one on the left too.... Now I've got some decent scraps, it should be fun! Your mum is fab! So is the sewing the two of you did. So glad you have been having a wonderful time - I paper-piece from the wrong side too! What a wonderful post. Wish I could've shared some sewing with my mum! 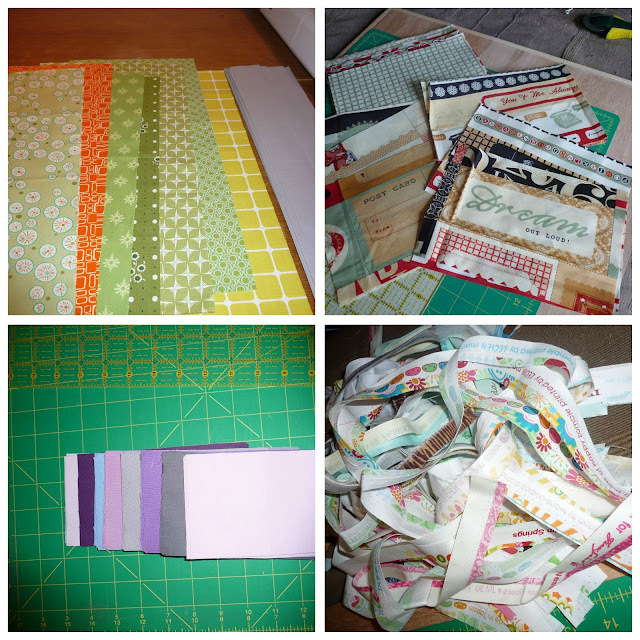 What a good idea for the fabric scraps - I leave my FQ's sitting there intact too, not wanting to break into them. Wow S - you've (or your mum!) have been so busy! I love that fabric in your first photo top right - what is it? Yay for your mum. That's a great idea. I do the same, sit and pet my fabric and don't cut into it. I think I'll borrow her idea and "create" some lovely scraps to use. Sounds like so very much fun. 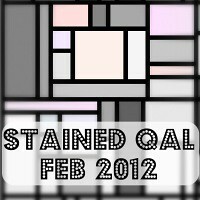 When does the "next" step for the QAL go up? not pushing just can't remember. How fabulous to be able to sew with your Mum! I'm so envious! I can't even persuade my daughter to sew with me so mostly I'm Billy-no-mates sat at my machine! Perhaps you could hire your mum out! Glad you and your mum had such fun sewing! Your foundation piecing looks great! Can't wait to see what else you've started! It looks like you two had a great time together! Yippee! How lovely for you to be looked after for a while, so comforting :-) and how lovely for you to have a special someone to sew with & natter to :-) and how lovely to have one's bits & bobs organised! Wonderful stuff! Sounds like great fun and love those blocks! It sounds like you and Mum are having a great time together, and stirring up quite a sewing frenzy! 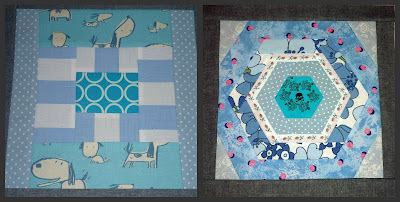 Love yours and your Mum's Bee Blessed blocks and the foundation pieced blocks, too. Have fun together! Sheesh, that is a lot of stuff. I wonder if your mum would come and cut up my fabrics like that - I wouldn't even make her clean the house or pack up my old clothes (but that does need to be done too). I am going to make that a priority to do every time I haul out the bundles of fabrics from now on as I too really don't have many handy scraps. 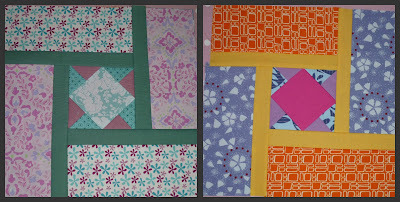 I love all your blocks, especially the paper pieced ones. Sounds like a lovely visit! Love all your blocks and you made me chuckle when I read about the Oz embroidery! !